Hello. Here's the situation: I own land at the END of a cul-de-sac. (I do have access to this land by other means). My neighbour owns land on both SIDES of the cul-de-sac. It is agreed by all parties (neighbours, me, Highways Authority, Land Registry) that there is Public Right-of-Way to my land at the END. I happen to hold that that includes RoW for Mechanically Propelled Vehicles (MPVs) - and wish to exercise that Right. My neighbour exercises and needs that Right for MPVs to access his land on the SIDES. Highways will not make a Determination as to what Rights exist but tell me that they will not permit me to take MPVs through to the END, whilst simultaneously turning a blind eye to - taking no action against - my neighbours use by MPVs. Putting aside the arguments for-and-against RoW for MPVs (there is much scope for a very costly court case), I wish to challenge Highways to make a Determination, my taking it to Local Authority Ombudsman if necessary. Am I entitled to a Determination by Highways? Are they allowed to sit on the fence? What exactly do the deeds state on this point? The deeds confirm Public RoW. They show that Highways had classified the Highway as Class 4 in, say the 1940s, which would normally lead to a presumption of RoW for MPVs - but Highways say that they will not be bound by that presumption! They are determined to sit on the fence i.e. they want me to go to court. I must emphasise that my question is about getting a determination; not what that determination is. determination that (for example) you can drive a vehicle on the M1! land over which you have the right of way. someone else (and the neighbour?) Or is it highway? your hearts content? 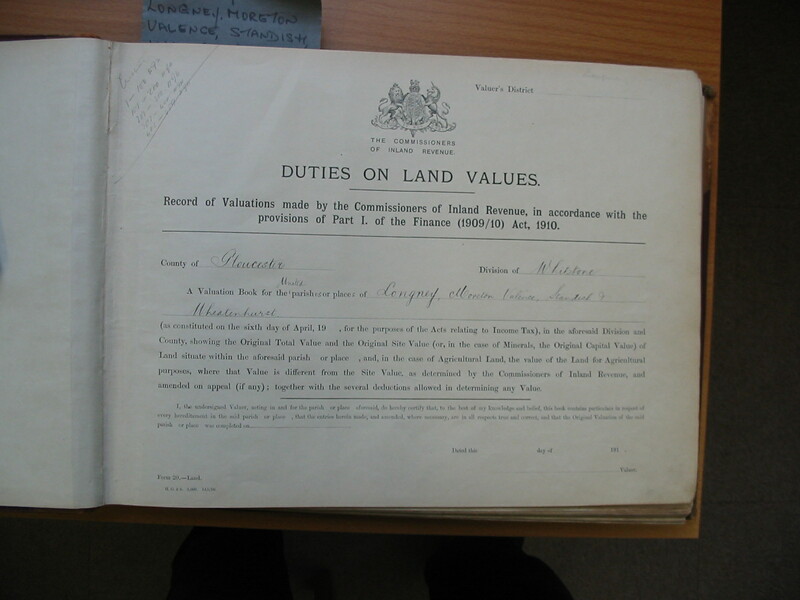 What does the land owning neighbour do? Thank you. I will reply in greater detail later today; and not expect immediate reply! I will be back this evening and on and off-line all day tomorrow. There is a lot of history to this but I did not think it fair to foist that on you if it could be avoided. However, I must dig into history in order to answer your questions. There is/was also issues about my making a new opening onto the highway; but we won't go there now. I believe that I have that in hand. Highways have been intransigent in not offering an opinion on whether RoW for MPVs exists over the area in question. They simultaneously say that they will 'not permit' me to drive MPVs over it! (And have led police to believe that I must not). I have led the horse to water but it will not drink. I have asked them what they mean by 'permit' but they obfuscate citing e.g. NERC 2006. I have told them that I am not aware of any legislation that requires me to seek [advance] permission for driving an MPV on (or onto) this particular unclassified Public Highway. Yet they turn a blind eye to my neighbours use of MPVs on the area in question. I am of the opinion that seeking a Determination is the most cost-effective way to cut this Gordian Knot. 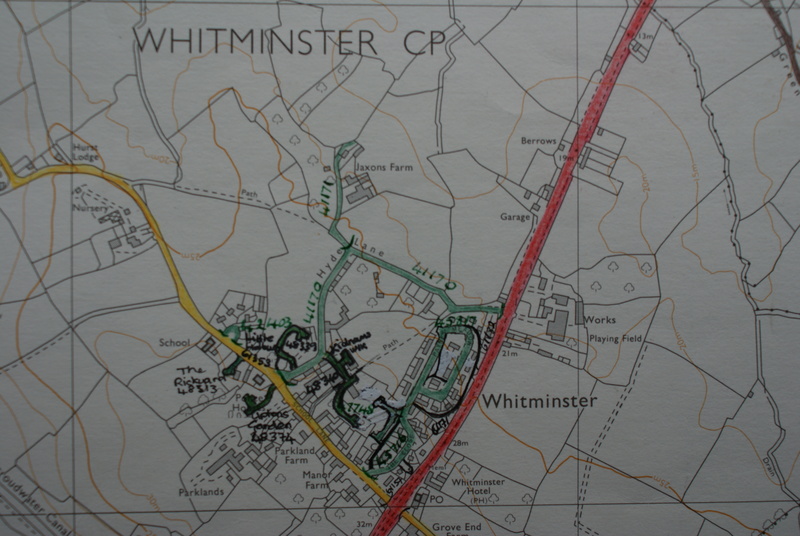 Unclassified (when the highway records were complied in the 1930's, the County Surveyor of the time listed these highways as "unmetalled tracks, bridle roads, and public footways maintainable by the County Council, but not including those suitable for wheeled traffic". Notwithstanding the subsequent publication of the Definitive Map of Public Rights of Way maps in the 1950's, the understanding is that Class VI highways do not normally carry vehicular rights. This can, of course, be rebutted by evidence to the contrary. This group of highways now also includes the footpaths associated with new housing developments). Their road records show that the the area in question is Class 4. Searches done during conveyancing also show this. I have put it to them that, having classified it as Class 4 (in the 1940s, I think), there should be a presumption that there is still RoW for MPVs now. They obfuscate and deny this, implying that I have to prove it - yet ignore Rose Cottage's use of MPVs over at least part of it (more on this later). The BLUE area is referred to in C. Charges Register, subsection 1. The nature of the RoW is not specified. Looking at the plan, you will see a roughly rectangular area just to the North of the BLUE area. This area used to be included within the BLUE area. The implication used to be that Rose Cottage owned all of the [larger] BLUE area (at least the subsoil). I successfully challenged this via Land Registry applying ad medium filum viae. So [now] I own the subsoil of that small area, 'my bit' (which perhaps should be coloured BLUE as well even though not within Rose Cottage's boundary). Please consider the BLUE area to comprise a 'SW half' and a 'NE half'. Consider also the small 'triangle' to the NW of the SW half. I believe that the SW half has been maintained as lawn in all living memory. I would accept that it is highly unlikely that any MPV has ever been driven over it. In 2000 Rose Cottage cleared the NE half of scrub and laid down hard-core over that area. They subsequently built stables (not shown) on their wholly-owned freeheld land adjacent to the SE edge of the NE half. (See why I tried to avoid going into this?). They gained access to this by driving from the lane to the South, around the SW half, over the 'triangle', to the NE half. Rose Cottage vendors solicitors tried hard to imply that I (or the Public that is) have no claim for RoW for MPVs - whilst being conspicuously silent about their clients'. It is Public Highway and this is not disputed by anyone. The issue is whether that RoW includes that for MPVs. Why don't I indeed? First because it would be unneighbourly to drive over what has for many decades been maintained as lawn i.e. to any casual observer would appear to be part of Rose Cottage's garden. So, to drive over it (the SW half which connects to the lane to the South) would invite confrontation with neighbours, who are then likely to get police support (because Highways have told them - arguably misled them- that I am 'not permitted' to drive over it). Finally, if it had to end up in court, I fear that that sort of action, arriving without 'clean hands', would not go down well and would damage my case i.e. reduce sympathy. As described earlier, my neighbour drives from the lane around the SW half, over the 'triangle', to the NE half. Hence my belief that the simplest course of action for me, at least initially to avoid court, is to try to get Highways to make that Determination. I think that it would be perverse for them to rule against MPVs as that would deny Rose Cottage vehicular access to their stables (which were built, incidentally, without any objection by Highways during the planning process). However, I am prepared to risk that outcome in the belief that the more equitable solution would be for them to make a Determination to allow us both RoW for MPVs. In theory I could then drive up and down to my hearts content. In practice, I would seek a private RoW over the triangle in exchange for not driving over their lawn. Highways point to the long-established lawn as evidence of the non-existence of vehicular rights. I hold that there is already a presumption of vehicular rights and that that sort of evidence might be brought into play if trying to rebut a presumption. Again - I think it easier to seek a Determination than get Highways to agree to my arguments. considered by Gloucestershire et cetera ". neither the blue land is highl way or it is not highway. be grassed over if the highway agree to it or grassed it. the area that they want to use, stopped up. cottage that it is Highway. relates to entry number one and two on the charges register. the road is shown as being adopted by them or not. I imagine it will not show. charges register but do you have the right to drive vehicles over it? I will get back to you later today if I may? The system seemed to tell me that this had been opened up to other service providers - without asking me first. Is that normal? Obviously I don't want two threads going at the same time. All questions are open to all experts all the time except that it is only "oficially" mine for 15 mins which is impractical otherwise you would have experts all over the place. So once I am involved, others leave it as I am dealing unless you relist because you have been waithing eons. 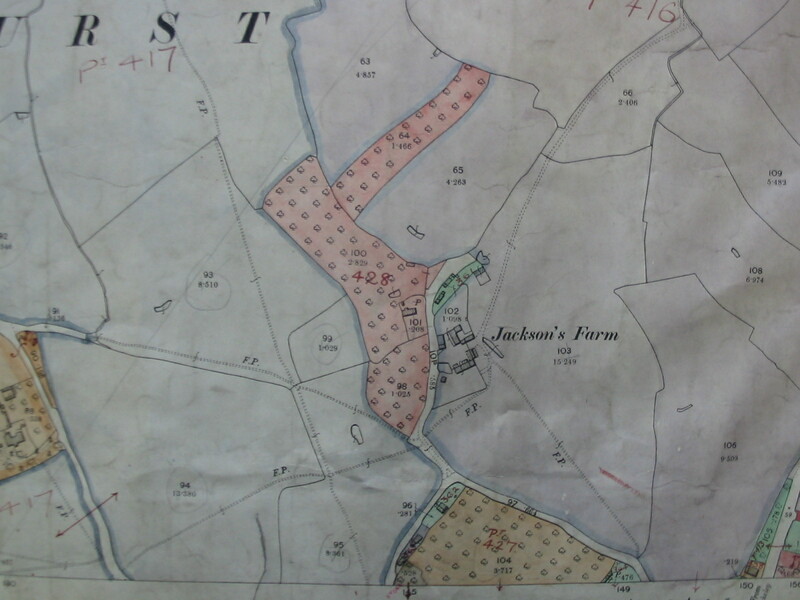 Gloucestershire Records Office has transcript of a Terrier document (dated 1727) referring to Jaxons Farm allowing another landowner a Road (capitalised in the transcript) to that landowner's land further afield, over Jaxons Farm land, via what is now the BLUE area which is described as a common or green. I infer from that that Jaxons Farm - specifically (i.e. the public in general) - must have been able to use that area which was subsequently known as Dark Lane for access - otherwise how could Jaxons Farm allow another landowner onto/over their land? I believe that 'Road' generally includes wheeled traffic. However, I have not mentioned this document to-date in any correspondence (keeping my powder dry?) as it is quite difficult to interpret and in case we all go off at a tangent and get distracted from perfectly valid more recent history. Tithe Map of 1838 shows the BLUE area as an uninterrupted continuation of the lane from the South of Rose Cottage to my land at the further end of the BLUE area. By uninterrupted, I mean that there is no boundary shown between the lane to the South and what is now the BLUE area. I have copies of sales particulars plan in 1923 similarly showing no boundary. 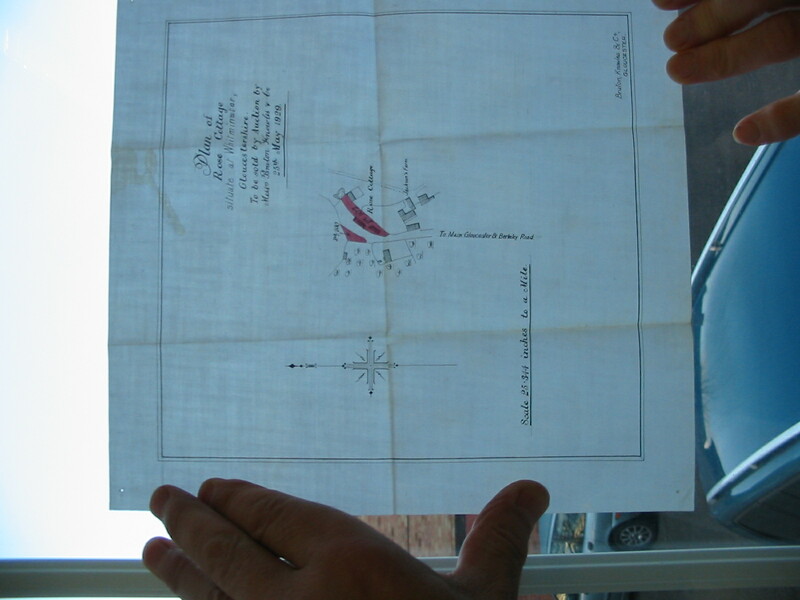 I have a copy of conveyance plan of 1962 - again showing no such boundary. I do not have a copy of the conveyance in full. As a result of inquiry about the 2000 conveyance, I have a copy of plan accompanying a conveyance of 1976; and this shows the BLUE area as a demarcated separate area. I do not have a copy of the conveyance in full. This is the first evidence that I have that the BLUE area was wanted by anyone for it to be treated as a separate entity from the highway in general. Rose Cottage was first registered when it was purchased in 2000. The conveyance was accompanied by a declaration by the vendor that (I must paraphrase) the BLUE area was conveyed to the purchaser of 1976 i.e the vendor of 2000; and that the purchaser, and tenants, had used it with undisturbed possession, 1976 - 2000 "... without any claim adverse to my title other than an assertion by Gloucestershire County Council (GCC) that it forms part of the public highway"! i.e. the vendor, on a wing and a prayer, hopes that a declaration will overcome some wording in the above conveyances, to which I am not privy, that indicate that GCC have never wavered from considering the BLUE area as other than highway. To my understanding Rose Cottage has now been sold (2013). Thank you sincerely XXXXX XXXXX interest and time. I was not aware that that wording was unusual. Are you saying that such entries are normally or often more specific? [n]either the blue land is highway or it is not highway. No-one at any time has disputed that it is highway. See above history. Only in 1976/2000 has there been an innuendo that the BLUE area is other than Public Highway. The BLUE area simply went out of use (but once a highway always a highway). We observed the scrub occupying the NE half of the BLUE area when we arrived at Jaxons Farm in 1981. I think that the SW half was maintained - and mowing will, of course, eventually establish grass or a lawn. So I would not suggest that anyone at any time should have sought permission as the grassing was not premeditated. It is what happens. Yes. I am aware of the rules for stopping up. (The purchasers of 2000, vendors of 2013, have been trying to pull the wool over the eyes of prospective purchasers for several years, telling them that stopping up is a formality. Each time, the purchasers have discovered that it is inconceivable that they would succeed in an application to stop up if Jaxons Farm objects). The new (2013) owners [say that they] understand the situation. I totally disagree. No-one disputes that it is Public Highway - and anyone would be utterly foolish to do so. One isolated confirmation of acceptance of this (over and above the implicit acknowledgement by the vendor of 2000 in their declaration): when applying for planning permission for stables adjacent to the SE edge of the NE half of the BLUE area, the owner acknowledged in writing to the planning authority that it was adjacent to public highway. Again, I disagree. I do not think that that is the reason. I think that the reason is to do with what is the nature of the RoW not the existence of Public Highway. It could be personal, of course; I have been persistent . I think that they are craven. They are too frightened to make a decision that could be challenged. They hope that Rose Cottage and I will fight it out in court while they are called as witnesses. I have told the owners of Rose Cottage that I have no dispute with them. My argument is with Highways. They are not shouldering their responsibilities in being an AUTHORITY! I think that phrase is they use is 'maintainable' - then they choose to what standard. Class 4 might receive zero maintenance, for example. It is crystal clear: the BLUE area is Public Highway. Highways have consistently classed is at Class 4 (coloured green). I am dismayed at their intransigence in their refusal to make a Determination over the precise nature of the Rights over it. I don't think that you are oversimplifying it. I do seriously think that Highways are not doing their job. However, please could you re-appraise my original proposition - that getting a Determination might be the best fall-back course of action? I do not have the heart to take them to court. I have always been a little unclear on what 'adopted' means. I think that it means that, having conceded that the road is Public Highway, the Council (or rather Highways operating under their umbrella) will (i.e. adopt) or will not (i.e. not adopt) maintain it at public expense. I do not think that an issue. It has not been maintained nor do I expect or want it to be maintained at public expense. I agree - it will not show; so I have not bothered to enquire. Because highways get overgrown - by nature. Footways (verges) are by convention maintained by adjacent landowners. The convention is to let sleeping dogs lie. I have no problem with that. I have a problem with them ignoring a rational request to allow use of this Public Highway by MPVs. Yes, I do (not because of what is 'granted' in the Charges Register, but because no argument has been made against what I believe to be an absolutely valid presumption that RoW for MPVs exists). But I want Highways to accept that. Failing that - make a Determination, get off the fence... Be an AUTHORITY. very sorry, but website will not allow me to upload images IMG_492, 501 & hydelane.jpg (have tried many times). May I post them to you by some other means please? have manged to tag on IMG_492 & 501 but cannot seem to load hydelane.jpg. Am having to consider abandonning this website if I cannot upload. Any ideas? Life is too short. Sorry forgot to respond regarding entry number two on the charges register: it is something to do with proposed wartime works in the field off to the NW - nowhere near the BLUE area. Road no. 41171 is coloured green (Class 4 according to their internal classifications) and extends to the far end of the BLUE area. They can take up to 24hrs to arrive as they are fwd manually. Why dont you simply do on the land what you want to do and let highways try to enforce it? Then you can defend it rather than you make the application. Thanks - have managed to upload docs above. I could threaten to drive over Rose Cottage's lawn (Anyone looking at it would say it is part of the garden) - but I am very reluctant to do it because I fully expect the police (who have been in touch with Highways over this i.e. 'misled') would take their lead from Highways for interpretation and would probably arrest me for Breach of the Peace or something. I just would not expose myself to the adverse publicity in local, if not national, press! "Irate Farmer drives over Innocent Quiet Couple's Lawn - Toddler put in Harm's Way!" "Rural Idyll Trashed by Angry Farmer" You get the picture? Also: I know how stressful Court Cases are - even defending; but I am just about prepared to go the Local Ombudman which might be a little less stressful. (Part of my case to Ombudman would be the unfairness of turning a blind eye to neighbours use by MPVs whilst 'not permitting' mine - that should be a serious embarrassment to them which they would wish to avoid) I come back to my original proposition: Can I 'force' Highways to make a Determination - or are they entitled to sit on the fence? Government Ombudsman as you have suggested. will have to give notice to the local authority. would not be wasting money on solicitors correspondence. I am not confused. Someone conveyed Highways' land (topsoil thereof) that they shouldn't have as it wasn't theirs to sell. That is why the purchaser made a Declaration acknowledging Highways' claim - in the hope, on a wing and a prayer, that that would solve the problem. It hasn't. Clearly Highways still own the topsoil (once a highway always a highway). No-one holds otherwise (i.e. no-one is rebutting this) regardless of any vagueness of The Land Registry entry. My original questions were "Am I entitled to a Determination by Highways? Are they allowed to sit on the fence?". I was hoping, ideally, that you could provide me with a relevant precedent to quote to Highways. I was aware of s 130 of DOE Circular 1/83, paras 19 & 20 and R v Lancs CC, ex p Guyer (1980) in the Court of Appeal. I quote from RIGHTS OF WAY, Riddell & Trevelyan, 2nd edition 1992: "...where a serious dispute existed concerning the legal status of a way, with conflicting evidence as to whether it was public or private, an authority was under no duty to assert the applicant's claim... From this decision it is clear that the legal status of the path should be established e.g. by an application under WCA 1981 s 53 ..." This application for a Determination would be to Highways not the Court. Unfortunately this precedent and that circular are not a perfect fit; but I infer from it that Highways can be required or obliged to make a Determination - not just sit on the fence; and was hoping that you would be able to point me in the right direction as how to make them. If I can get a Determination from Highways using persuasion, I do not have to go to court. Can you find me a relevant precedent or guidance for Highways that will make them sit up and do something - under the threat of Complaints Procedure, followed by Local Authority Ombudsman? Other than point them to the legal authorties you have quoted, then if they simply ignore you, you must make the application to court. access if you don't want to use/pay for solicitors.